Auctioned on eBay in October 2005. 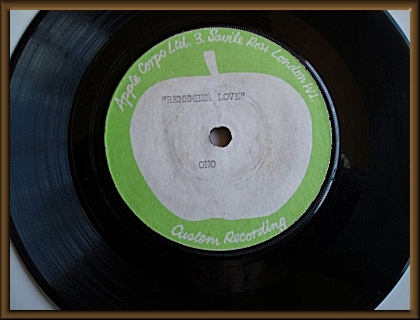 John Lennon's first solo outing, taped in a hotel in Montreal on the 1st June 1969 for release one month later as the debut single for The Plastic Ono Band.The record comes in a matt Apple sleeve. Side A run off carriers APPLE 13A-1 , to the left 12 and to the right 177, side B APPLE 13 B-1 , and 10 and 228 as above, plus KT tax code to each side . Vinyl still has some shine, played just once by me to playgrade, GPAC certainly a VG, RL no better than fair, but playing it seems pointless. Early Apple labels like this are very fragile so I've made no serious attempt at cleaning it. The Beatles were splitting up at this stage so this record is an important stage in Lennon's career, he even credited it to Lennon/McCartney , his test pressings are rare. 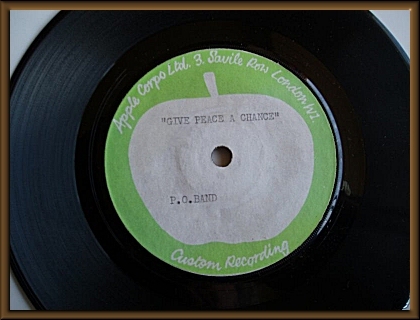 This record's sentiment seems more relevant today than it did in 1969!